Malawi Congress Party (MCP) Vice President Muhammed Sidik Mia says the incoming MCP government will set precedent to respect former heads of state. Mia was speaking on Tuesday at Chapola Primary School ground in Traditional Authority Chimwala in Mangochi district during a political campaign rally. He said this after expressing concern over the delay of justice delivery in a case where former President Bakili Muluzi is has been dragged into court for a lenghthy period of 15 years. The MCP Veep and Presidential runningmate said taking too long on the case involving former head of state is not only a sign of disrespect for the former Malawi leader but also the typical example of justice which being denied through delay. He therefore emphasized that MCP will respect the former leader as he deserves such respect. Reffering to the electoral alliance with the Peoples Party (PP) whose leader is former President Joyce Banda Mia said MCP found it important to work with Malawi’s former leader who commands high respect for being former head of state and also for leading party which is politically strong. Deep in his speech, Mia said the MCP government will improve agriculture in the country by introducing mechanical system for rural farmers to harvest bumper yields. Mia said its very pathetic that Malawians are still using hoes when farming since independent, which makes the community produce less food for their families. He urged the electorate to choose Chakwera and him as runningmate because MCP has good manifesto of transforming people’s lives through agriculture sector in the country. PP Provincial Chairman for the Eastern Providence, Muhammad Matola said, winning is the game of numbers hence the call to the community to give MCP their votes for Chakwera and Mia to emerge winners. He said, their alliance with MCP gives them confidence of winning the election on May 21. 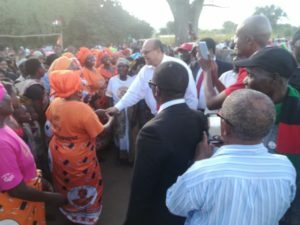 Matola further said PP President Dr Joyce Banda withdrew from the race to support Chakwera and Mia as they are only candidates who can transform the status of the country.